You can configure Guardian to allow or stop users accessing the Internet during certain time periods depending on the time and day. 1. Go to the Guardian > Policy objects > Time slots page. • Name — The name of the time slot. • Comment — Enter an optional description for this time slot. 3. 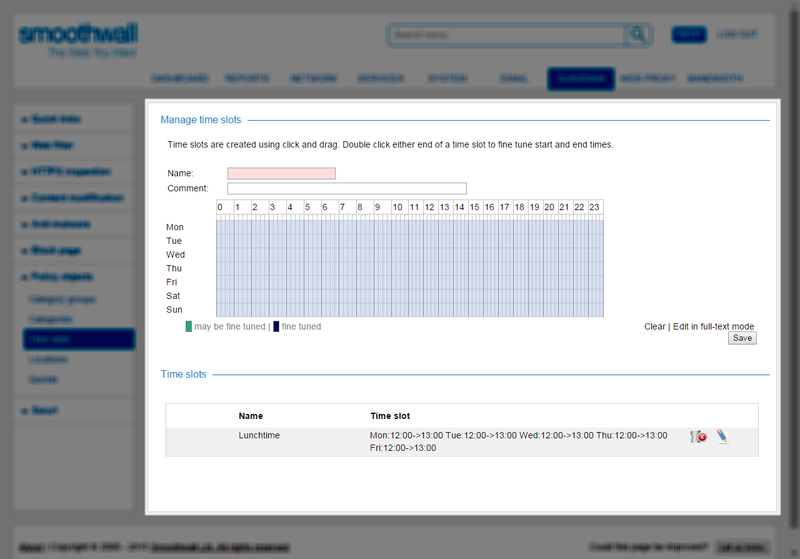 In the time-table, click and drag to select the periods of time you want to include in the time slot. 4. Click Save. Guardian creates the time slot and adds it to the list of time slots. It also makes the time slot available where applicable on the policy wizard pages for inclusion in policies. 1. Go to the Guardian > Policy objects > Time slots page and, in the Time slots area, locate the time slot you want to edit. 2. Click the Edit time button. Guardian displays the time slot in the time-table. Tip: You can use the Clear and Edit in full-text mode options to make changes the time slot. 3. Make the changes you require and click Save. Guardian makes the changes and saves the time slot. 1. Go to the Guardian > Policy objects > Time slots page and, in the Time slots area, locate the time slot you want to delete. 2. Click the Delete time button. Guardian deletes the time slot.